Travel through time and experience the largest privately owned transportation museum in the world! Car aficionados and novices alike will appreciate the great collection that Michael Dezer has amassed over the years. When you’re driving on Biscayne Boulevard, you can see what looks like an old gas station with a few classic cars and a sign overhead that says “Dezer Collection.” Growing up in the area, I must have passed it a million times. I wondered what all the fuss was about, especially since it looked so small. Boy was I wrong! Turns out the two buildings that hold the collection are around the back. All together, there are over 250,000 square feet with over 1,000 vehicles! Right away, you’re hit with bright lights and incredible memorabilia. Now, I’m not really into cars. But I can appreciate the dedication and passion it took to create this collection. Plus, it turns out there weren’t just cars. Aside from vintage cars, there were also cars from various movies, motorcycles, scooters, bicycles, and military vehicles. Scattered around there were also keepsakes that went along with the era of the cars (I fell in love with an old school Coke machine). My favorite exhibits were the Hollywood Cars of the Stars (which included the Gotham Gallery) and the James Bond Exhibition (which included a plane and helicopter!). Have you ever been to a car museum? We’d love to read your comments below! Hey Vicky and Buddy! Not sure if you noticed, but I have already pinned and shared this post of my own accord. 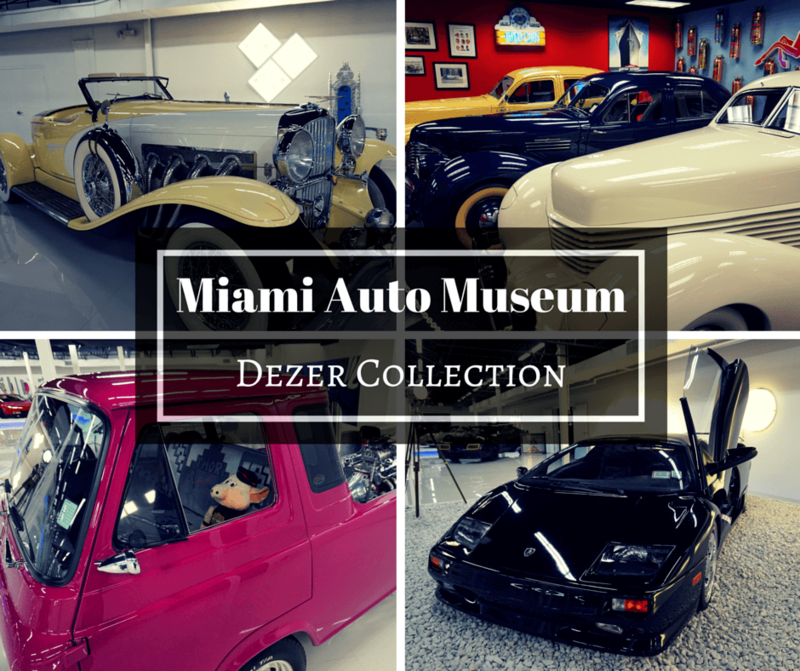 As roadtripping Floridians, the Miami Auto Museum Dezer Collection is now on the Backroad Planet Florida Wanderlist. We love auto museums. Every Sunday here in Aliso Viejo, we attend the Cars and Coffee car show and we always find something we’ve never seen before. That sounds like a lot of fun Lesley! I’m not a huge car person but there is a lot of history that goes along with them. My family lives in Detroit and I’ve gotten to go in a few there. Looks like this would be another good one to explore. I think that would be really cool to go see too! Ah, I just can’t get excited about cars, but my husband would love this. I should still go and see it anyway, though, because I find museums like this can open up a whole new world for people. It certainly sounds like a great museum. The Dezer Collection looks like a really fun place to visit. I love old signs and really enjoyed seeing the ones in your photos. I’d go just to see those! Oh yeah, plenty of those and other really cool things. Fantastic hidden find! Thanks for pointing it out — would have never found it otherwise. I’ve always wondered what this museum was like–thanks for the peek inside! I think it would be fun to check out on our next visit to FL, and I can see where it would defiantly be a good indoor activity for an afternoon! Awesome! I’ve just added this to my list! I love cats and their history! I’m a car girl and would love to see this. Miami just keeps unfolding amazing things to do and explore. Thanks for the tips. I’m glad you enjoyed it Elaine!